I literally read Cant Stop Wont Stop: a history of the hip hop generation in one sitting, in the back yard of my house last summer. It sounds cliche but i just could not put this amazing book by Jeff Chang down. Chang has managed to write one of the finest history books dealing with the US from the 1950s to present. One of the best things about the book is that while one only need look over the first few pages of the book to realize how radical Chang is, he attempts to tell history like a grandfather telling stories to the younger generation, instead of weighing his annalysis down with over played radical jargin. I chose to reprint parts of the section Stakes is High because I feel like Jeff has captured the spirit of actual people living in LA that signed peace treaties and fought the police better than any other observer. The reason this section is so good is because Chang is less of an outsider than most who have looked at the riots, he grew up within the west coast hip hop community and he is a Korean American; both of which play a pivitol role in his analysis of the historic events of April 1992. A little side not on the title: I thought it was a funny joke to use No We Can’t All Just Get Along, because of the fact that the riots actually united the city of LA more than any other event in recent years. White, Black, Latino and Asian communities united together against their common enemy, the police. For folks who are interested in understanding the LA riots of 1992 this is the zine for you. While the zine Three Days that Shook the New World Order is an alright attempt at understanding the riots, one is left with the notion that the Chicago Surrealist Group just seized upon the riots as a way to explain their manufactured boring rhetoric. 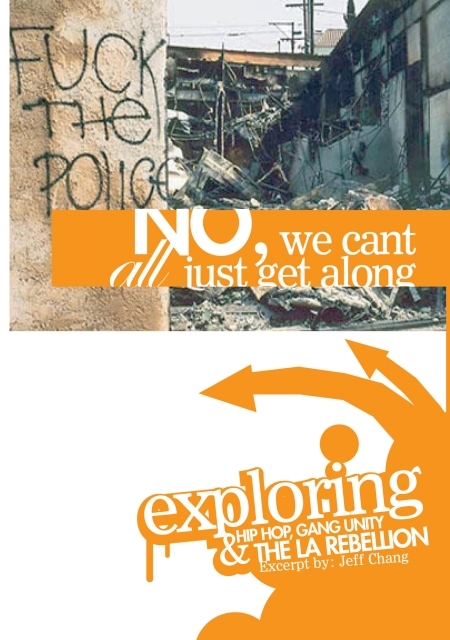 Also that zine continually discounts the role of gangs in the riots, which is just a fallacy. This zine is broken into three chapters the first one is titled Black Los Angeles which breaks down, in short form, the history of LAs racial hostilities and class conflicts, along with giving a brief history of the Watts riots of 1965. In this chapter we also learn about the desperation that led to the birth of the postindustrial gangs, and how they sprang out of the corpse of the black power movement of the late 1960s. The second chapter, Peace Treaties and Burning Buildings, focuses on the rebellion of 1992 and the gang unity project that led up to the riots. Chapter three entitled the War on Youth, shows us how the state purposefully targeted gang peace makers for fear of a united army of poor youth. Smaller, copycat riots occurred in other United States cities. San Francisco police arrested 1400 rioters in the downtown area and established a curfew. The Nevada National Guard was deployed to Las Vegas and 200 people were arrested. Seattle was hit by overnight mobs of up to 100 people rampaging through business districts. New York saw a mob looting a shopping mall, and another at Madison Square Garden. Hundreds of protesters confronted police in Atlanta. Minor incidents were reported in Tampa, Pittsburgh, Birmingham, and Omaha. Major incidents took place in Dallas and Madison, Wisconsin. Violence even spread to the Canadian city of Toronto.